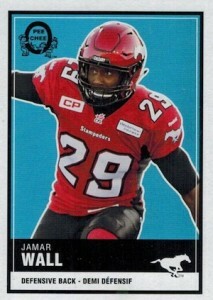 2015 Upper Deck CFL Football marks the second set of cards under the card maker's Canadian football license. Framed like a flagship release, things are kept relatively simple with much of the focus on the main set. But that doesn't mean that there aren't other elements and inserts for those looking for something a little more. Among these are two game-used jersey cards per hobby box. 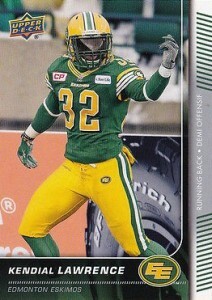 The 2015 Upper Deck CFL set has a total of 200 cards. Within these are different subsets. Players on the offense make up the base set. Defense and special teams players combine to land every other pack while All-Stars and Star Rookies are 1:4 packs each. When it comes to sports cards, there's nothing more Canadian than O-Pee-Chee. 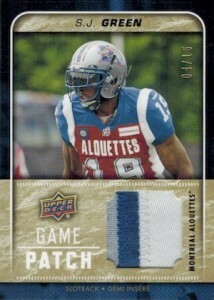 O-Pee-Chee Retro brings the familiar name, which has a history with vintage CFL cards, with a throwback look and feel. These inserts land 1:3 hobby packs. The Game-Used Jersey checklist is decent in size with as many as 40 players. Patch versions come serial numbered to 15. 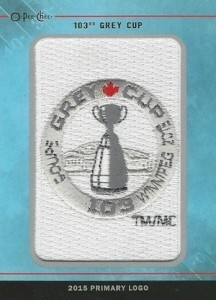 Team Logo Patches continues from where the manufactured relics started in 2014 Upper Deck CFL. Inserted 1:128 hobby packs, 20 new cards have been added to the set. 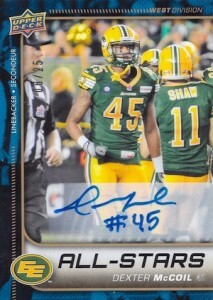 Autographs are the rarest cards in 2015 Upper Deck CFL. 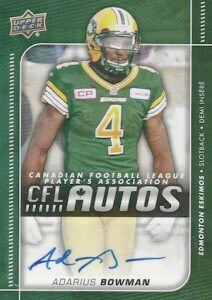 CFL Marks, which includes some of the league's top players, fall 1:384 packs. 86 cards. Offense Odds - 1:96 packs; Defense/Special Teams - 1:256 packs. PARALLEL CARDS: Blank Back (Unannounced). In a set that barely anyone noticed last year, what did they add for excitement? 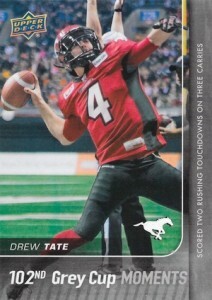 Does Flutie, the Gretzky of the CFL, have an auto this year?? Just opened a box, pulled a Kevin Glenn auto, 1:384! Nice set, 50 more cards in the base. Thinking of a second box. Just picked up a card called “Limited Edition Game Glove” #GG-JS. It’s listed as being part of the 2015 set. Any idea what this is, since I don’t see it on the checklist? I know this card set & the posts in it are a little old but wanted to address the very last question posted by 56Parkies. I think what you are talking about is actually a card from the 2015-16 SP Game Used Set instead of this 2015 Upper Deck CFL Set. I searched from Google & other websites & the #GG-** are the cards listed from the 2015-16 SP Game Used Set. Thanks. Bought a box of these from Dave’s Card World for a very very good price discounted at 80% off. Pulled a card that is not listed in the checklist above. It’s an O-PEE-CHEE Retro Set card insert. It’s player Trevor Harris(QB) from the Argonauts. However, the back of the card is completely blank. The card of his is listed as #16 in the checklist for the O-PEE-CHEE Retro inserts. I see there are no parallels like Blank Backs listed for this insert set. How rare would this card be considered Trey? Thanks. Upper Deck regularly includes unannounced inserts and parallels. They don’t generally reveal the odds for these. If it’s not listed on the blaster box, then the odds are unknown. UD does include Blank Backs often as a parallel and they are usually rare. Thanks for the quick reply Trey. This card wasn’t from a Blaster Box. It was from a retail box of 24 Packs with 6 Cards per pack. I also pulled a Ricky Ray Game Used Jersey card & an even bigger one in the 1 Card CFL Heroes Set(Card) of Michael “Pinball” Clemons which is listed at 1:768 Packs. Would you have any clue Trey what this card would be worth? That’s very very low odds so basically 1 in like 32 boxes of pulling this card. Thanks again Trey. The most recent sale was for $20 and there are two listed on eBay around that same amount. Thanks Trey. I didn’t even think to look on eBay to see even if this particular card was listed. I didn’t think it would be on there because it was a CFL card plus the low odds of pulling it so that’s why I asked you here first. Thanks for letting me know.